Ethical consumerism is on the rise. No longer bound to the counter-cultural fringes, ethical concerns and practices are reaching into the mainstream of society and being adopted by everyday consumers – from considering carbon miles to purchasing free-range eggs to making renewable energy choices. The wide reach and magnitude of ethical issues in society across individual and collective consumption has given rise to a series of important questions that are inspiring scholars from a range of disciplinary areas. These differing disciplinary lenses, however, tend to be contained in separate streams of research literature that are developing in parallel and in relative isolation. 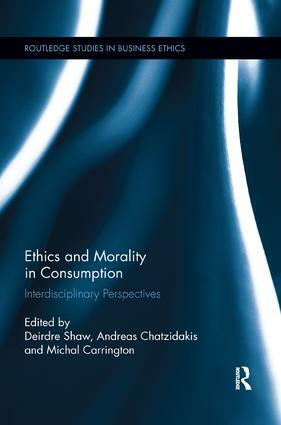 Ethics in Morality and Consumption takes an interdisciplinary perspective to provide multiple vantage points in creating a more holistic and integrated view of ethics in consumption. In this sense, interdisciplinary presupposes the consideration of multiple and distinct disciplines, which in this book are considered in delineated chapters. In addition, the Editors make an editorial contribution in the final chapter of the book by combining these separate disciplinary perspectives to develop a nascent interdisciplinary perspective that integrates these perspectives and presents platforms for further research.